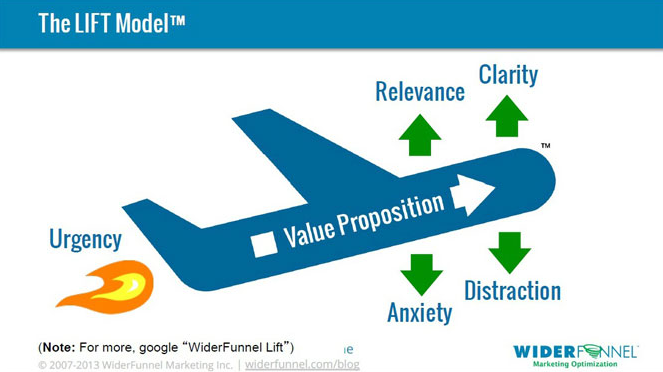 The Lift model from Widerfunnel is a commonly used framework for evaluating a digital experience using a heuristic evaluation. It identifies six key factors that influence your conversion rate; the value proposition (which is core to any optimisation process), relevance, clarity, anxiety, distraction and urgency. 1. Value proposition – What is your value proposition communicating to visitors and what is unique about your proposition compared to your competitors. 2. Relevance – how relevant is your message and content to the user, does it meet their expectations and how does it relate to the source of traffic or their buyer persona? 3. Clarity – how clear is your value proposition, communicate a single compelling messages, what the next steps are, have a clear visual hierarchy and call-to-actions? 5. Distraction – How do you prioritise content to reduce distractions, avoid complex backgrounds and have a single compelling CTA? action now rather than later? Do you use scarcity and loss aversion to create a urgency? Heuristic evaluation – How to conduct a heuristic evaluation of a website.